I like thst it give a matte look. Seems like a good primer! I don't need one either though as I have dry skin too. I will have to give that a try! It sounds like a good product! Thanks for visiting my blog. Great review, I never tried this brand. Following you with GFC , Bloglovin and Facebook. 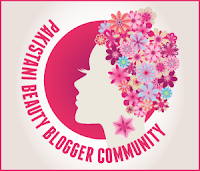 I follow your blog... can you follow mine too? I am now your follower number 59. I'm sure it's a good tool, sorry we did not find it! Would you like to follow each other, let me know! Ive actually never tried using a primer before, thanks for this excellent review hun! May your week get off to a great start! i should get this !!! This primer looks awesome! Wish they had it in the UK. Good review! I really like your blog, and I love clear primers, I think they have a better finish than tinted ones. I haven't had luck with primers really, they don't seem to work on me..
this looks like a great product! thanks for sharing your review! SPACE AVAILABLE TO DISPLAY YOUR PRODUCTS AT "SURF THE SHOP", DHA, KHI. Bukhari Commercial, DHA phase 6, Karachi. promotion in Bukhari Commercial and adjoining areas of Defence phase 6. Well you did rate it 4 out of 5, so I'm hoping it's pretty good.